Members of a Du Noon savings scheme plans to buy houses, cars and payment for sons’ circumcision have been dashed after the stokvel secretary – a pastor’s wife – allegedly made off with R300 000. The entire family, including the pastor, appears to have absconded to the Eastern Cape with money. At the pastor’s home in Ekuphumleni informal settlement where the couple lived in a four-bedroom shack with their four children, member of the stokvel were selling the family’s belongings on Tuesday in an attempt to collect money to enable them to search for the missing secretary. 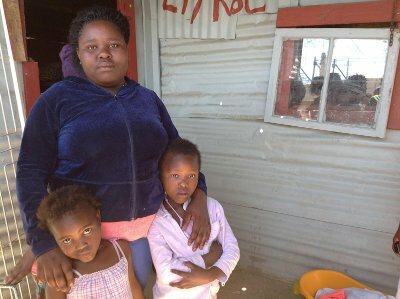 Stokvel member Lazi Ngalo, 25, a mother of three children, said she will not be able to send her brother to get circumcised in the Eastern Cape in December as the R15 000 she contributed to the savings scheme on Sunday has disappeared along with Portia Biyo. Ngalo is one of 210 members who have been putting money into the Ilitha savings scheme founded earlier this year by the group of Du Noon residents. The residents discovered the disappearance of Biyo on Sunday evening and on Monday they searched throughout Du Noon for her. Not finding her, they approached Biyo’s niece who took them to family members in Mfuleni where they learnt Biyo had moved to Port Elizabeth, said stokvel member and bank account signatory Nomvano Siphukuza, 32. Siphukuza said she had contributed R32 000 to the saving scheme. She said with the help of police, they discovered Biyo’s name on a list of bus passengers that travelled to Port Elizabeth on Sunday. The list contained her name and that of her husband and children. While some stokvel members busied themselves with selling the belongings in the family’s house in Ekuphumleni informal settlement yesterday, others went to open a case at the police station. The alleged theft was putting some member’s marriages in peril as husbands whose wives had contributed to the scheme did not believe that the money had been stolen. “We are very worried. Our husbands do not believe us. They don’t trust us. We are innocent. We don’t know how to convince them,” said stokvel member Bukelwa Peter.